Okay, everypony, hang on to your saddlebags. We're moving to a new thread! There's a new thread cap of 500 pages because of maintenance issues and so -- to Cloudsdale! 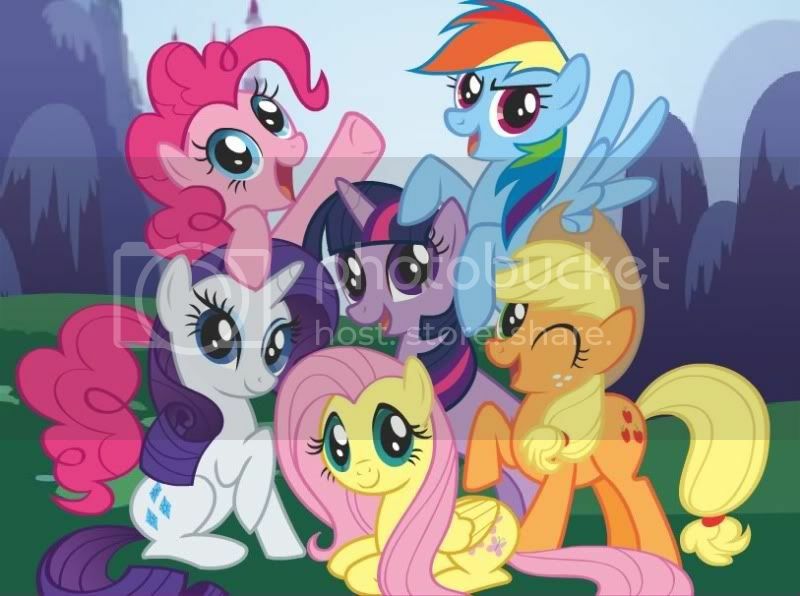 Ladies and gents, we present: the new My Little Pony: Friendship is Magic thread. 1) Obscene posts are not funny. And if you seriously wouldn't say something in front of your parents/grandparents/clergy/significant other's parents, you shouldn't post it here. Just because a few moderators enjoy the thread and the show does not mean that when lines are crossed, folks won't get warned. 2) Keep it on topic. It should always stay in the vicinity of MLP. 3) Your blog. It's not here. 4) Don't feed/taunt the trolls. Report them. 5) For Celestia's sake, don't multiple quote something someone else said when it's warn-worthy. Smackings will result. With that, let us resume with season 4 of MLP: Carousel Boutique. Last edited by Katganistan on Thu Jul 05, 2012 1:13 pm, edited 1 time in total. Well, second after Kat. Close enough. So, where were we. Discussing season 3? Last edited by Wisconsin9 on Mon Jul 16, 2012 2:42 pm, edited 2 times in total. We are currently 33% through the Trump administration. Last edited by Olthar on Mon Jul 16, 2012 2:42 pm, edited 1 time in total. Last edited by Seshephe on Mon Jul 16, 2012 2:43 pm, edited 1 time in total. AHAHAHA. Cloudsdale won! That's friggin' hilarious. I'm putting a stake in this thread. Everything over here is mine. This is glorious, so many pages to corrup-I mean, fill. 09/26/11 - Never Forget. MLP: FiM I; Rest in Peace. 09/27/11 - Exile is created. 10/02/11 - We won. Magic returns to NSG. 03/08/12 - Sugarcube Corner surpasses old thread in page count. 04/08/12 - Carousel Boutique opens up. 09/02/12 - Srsly, no hotlinking. Enjoy Canterlot Castle. 11/17/12 - Everfree Forest discovered. There is a reason I had to do that -- I made this and the next thread a while back -- so when I moved it to A&F it wasn't showing up. Bumped it to the top page. Those 3 no-thread minutes in which I felt completely lost and alone in the world. Anyhoo, GTG. I'll drop in for 5 minutes tomorrow to say goodbye and celebrate my 2nd NS Birthday. Katganistan wrote: There is a reason I had to do that -- I made this and the next thread a while back -- so when I moved it to A&F it wasn't showing up. Bumped it to the top page. Wisconsin9 wrote: Well, second after Kat. Close enough. We were discussing a fake season 3 announcement video. I know. I consider the person after you to be first, since you obviously have a completely unfair advantage. Ah. I have not seen it. Hello Ameri. It's nice to see you in this thread. There are PLENTY of names for other threads. Jeez, a little love for the Pegasi. Ameriganastan wrote: We were discussing a fake season 3 announcement video. I'll try and find it. Speaking of Ameri, since you're field commander of Operation Undertaker, can you give me a status report on stage two? Olthar wrote: Hello Ameri. It's nice to see you in this thread. Wisconsin9 wrote: Speaking of Ameri, since you're field commander of Operation Undertaker, can you give me a status report on stage two? ...You forgot about Operation Undertaker? The contingency plan we drafted in secret in case he reneged on the bet? I can't find the video. Ameriganastan wrote: I can't find the video. Oh well. Doesn't really matter. Wisconsin9 wrote: ...You forgot about Operation Undertaker? The contingency plan we drafted in secret in case he reneged on the bet?